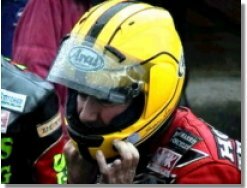 Joey Dunlop Tribute from the TT Website - Joey Dunlop R.I.P. Say the name Joey Dunlop to any true bike fan in almost any part of the world and they will know instantly who you are talking about. Not some here-today-gone-tomorrow, manufactured superstar with an ego to match his pay-cheque, but a quiet, shy part-time publican from a small town in Northern Ireland. The worlds greatest living sportsman, the words of Big D, Irelands loudest commentator are an apt description of this most remarkable of men. William Joseph Dunlop MBE OBE, is the greatest motorcycle racer that has ever lived. I say that without shame or without doubt. He was, and will remain, a hero to hundreds of thousands of people, young and old alike, in every far-flung corner of the world. He inspired generations of young Irishmen to take up motorcycle road racing, and can almost single-handedly take the credit for the strength of the road racing scene today. But Joey wouldnt dream of it. In fact he would be embarrassed beyond belief at the very mention of such a notion. The man was modest almost to the point of self-denial. He never wanted the limelight, the fame or the attention. Joey was a reluctant hero. He just wanted to race bikes and to win. The Dunlop legend all started rather inconspicuously aboard a £50 Triumph Tiger Cub at Maghaberry in 1969, as a bit of fun with my mates. It was the mid 1970s before Joey established himself as a regular winner, and from that point on, he never looked back. He entered his first TT race in 1976: It was wet, I rode a 250, and Id never been round the circuit before, even in a car. I remember coming up to Ballacraine and didnt know whether to turn right, left or straight ahead! Amazingly, and perhaps as a foresight of what was to come, he finished all three races he started in, including a good 16th position in the Junior 350 event aboard a new 350 Rea Yamaha. The following year, still a virtual unknown at the TT, he beat all the favourites to take the 1977 Jubilee TT aboard a privately-entered TZ 750 Yamaha. A few barren TT years followed before he won the 1980 Classic 1000cc race, again Yamaha-mounted. That same year he joined the works Honda team-with Honda boss Bob McMillan promising him bikes for life-to begin a 21 year association, making him Hondas most loyal servant bar none. The men in suits at Honda tried to change Joey, his unkempt appearance and almost incoherent accent not really conforming to the Honda image. But it was soon apparent that they were wasting their time, and they left him pretty much to his own devices, supplying him with the machinery required to do the job. And do the job he most certainly did. As well as winning countless Irish road races, including the Ulster GP and North West 200, he started winning TT races for Honda in 1983, beginning a winning run in the F1 event that was to last for 6 consecutive years from 1983-88 during which time he was F1 World Champion on 5 occasions. But the genius of Joey Dunlop extends much further than his many big-bike wins; equally at home on any bike from 125cc-1000cc, Joey was easily the most versatile rider of his generation . How many of todays WSB or GP riders could do a 120mph lap of the TT course on a 1000cc V-Twin, jump straight off that onto a 125cc bike, and do a 107mph lap ? None. Joey and his raw, unadulterated talent stand alone. At home in Ireland, Joeys record on the pure roads circuits will probably never be bettered. He was victorious in 24 Ulster Grands Prix, 13 North West 200s, and countless other races in the domestic series, including 17 wins here at the Skerries 100, making him the joint record holder for the most wins along with the great Raymond McCullough. Indeed Joey still holds the course lap record of 105.95mph, set in the 1999 Grand Final race, one of the most thrilling road races I have ever had the privilege to witness. It will be a long, long time before that lap record is bettered. On the Isle of Man, Joeys final tally of 26 TT wins will never be surpassed. 12 more wins than his nearest rival, and the only rider to win a hat-trick of hat-tricks at the TT, Joey had infinitely more talent than any rider on the current scene around the circuit which he made his own. I have spent many an evening or afternoon watching as Joey came around lap after lap, on the same line every time, totally at one with the bike, be it a 125cc single or a 750 4-stroke. Smooth doesnt even begin to describe his riding style: Joey was pure poetry in motion. His greatest ever win came this year, his 32nd year of racing, in what was to be his last ever TT race meeting. His victory in the F1 race on a totally new, ill handling Honda VTR SP1, which he had hardly ridden before, was the crowning glory of a glittering career. He and his family received a standing ovation at the prize presentation, the likes of which will never be seen or heard on such a scale again. But there was another side to Joey that only his closest knew so well. A quiet, devoted family man with 5 children to his childhood sweetheart Linda, the pair recently renewed their marriage vows in the same church in which they were married all those years ago. Although he was awarded the MBE for his services to motorcycle sport, it was perhaps his OBE for charity work which best gives an insight into this remarkable mans persona. Twice he has travelled with aid to Bosnia and once each to Romania and Albania, all under his own volition and all at his own expense. He would travel around the Ballymoney area in his own van collecting food and clothes from locals. When the van was full, he set off to wherever he was going. No fanfare. No razamatazz. Just Joey and a battered van full of aid, destined for those less fortunate than himself. Such a simple gesture. Please take a few moments to think about this. Such selfless, humble, decent acts only served to deepen the enigma and mystique that surrounded the quiet Irishman known universally as Yer Maun. Everyone has their favourite memory of Joey and mine will stay with me for the rest of my days. It was at the Southern 100 on the Isle of Man in 1999, and I stood watching Joey working frantically on his bike in order to make the next practice session. A man with a young son approached Joey and asked if his son, who was probably no older than four could have his picture taken with him. Joey smiled, downed his tools and lifted the boy upon to the petrol tank of his bike and sat smiling on the saddle himself whilst the overjoyed father took the picture. The man thanked Joey, who smiled and carried on working flat out on the bike. That young child now has a keepsake that he should treasure forever. And that for me summed up Joey as person: humble, kind and someone who always had time for anyone. Many clichés and phrases have been synonymous with the name Joey Dunlop over the years and it would be all to easy to conclude with one or two of them. Instead however, I feel the final words should go to the man who asked for so little throughout life, but gave so much to so many. I never really wanted to be a superstar. I just want to be myself. I hope thats how people remember me. We certainly will Joey. We certainly will. God bless. Yer Maun - William Joseph Dunlop - R.I.P.